The number of businesses that lack this most basic tool for cybersecurity is shocking. Many business owners have different antivirus programs spread among their various computers, and often they aren’t up to date. A few even have multiple anti-virus programs running on the same device. Standardization of antivirus and anti-malware software has its advantages. It will help save you money, your computers will run smoother, and it will be much easier to manage. Our Managed Services clients receive Webroot Secure Anywhere and Malwarebytes free of charge. However, we also work with your existing anti-virus programs if they are updated regularly (usually daily), have the ability to schedule regular scans, and can be monitored remotely. Not only can an infected computer run slower, your sensitive business data is at risk of being stolen, lost, or corrupted, and email accounts can be hijacked. Additionally, passwords can be harvested, customer information breached, identities stolen. Furthermore, a single computer within a company’s network has the potential to infect all the others. Protecting your computers is protecting your business and your customers. Has your computer been infected with a virus or malware? Your business computer should have professional grade antivirus and anti-malware software installed and updated. An infected computer can have the following symptoms among many others. 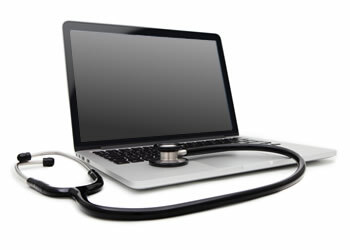 If you are unsure about your computer’s health, contact A Better Choice Network Solutions so we can run some tests. Malware is a classification of tiny programs (or coding attached to programs) that attack your computer. There are many variations of malware. Adware tracks your internet searches and website views to tailor advertisements to you in an attempt to sell you products. Key-loggers log your keystrokes so hackers can search for your passwords, social security numbers, and credit card numbers. Trojans will provide easier access to hackers by shutting down your anti-virus programs, or creating a back door for hackers. Finally, ransomware programs are known to encrypt or freeze your files and hold them for ransom. These are only a few examples of the dangerous things that malware programs can do. How often should I do a full anti-virus and anti-malware scan? A full scan should be done every 24 hours, with a quick scan performed every 4-6 hours at minimum for businesses. How does a virus or malware get on my computer? The internet is a wonderful tool for sharing information. Unfortunately, everything you do via the internet also makes you vulnerable to malware and viruses. Whether it is via email or just surfing the web, you will contract malware and viruses if you are not protected. Protecting you from these malicious programs is an ever-growing challenge. Multiple layers of cyber-security are utilized for the most important networks, such as hospitals and emergency services, yet they are still hacked at alarming rates. With the growing number of devices that connect to the internet (collectively called the “Internet of Things,” aka IoT), the challenges continue to escalate as well. What is the best anti-virus and anti-malware program? There are many anti-virus and anti-malware programs out there. If you ask 15 different techs what the best program is, they will likely give you 15 different answers. Specifically, we currently include Webroot Secure Anywhere and Malwarebytes with our monthly service. However, if you currently have an up-to-date Anti-virus solution or Anti-malware solution, we’ll likely work with whatever you already have. Get the Complete Guide to secure behavior online and in the office. Simply provide your email in the form below to get your free copy, today! Computer running slow? Let us scan your computer.